NASA's Juno spacecraft, currently in orbit around Jupiter, has just reconnected with Earth after its eight flyby. The Juno spacecraft, which entered orbit around Jupiter last year, has just made its successful eighth science flyby of Jupiter and is sending along reams of new data about the gas giant’s cloud tops and composition. NASA finally made contact with the probe after it swung by Jupiter on Oct. 24, as scientists had to wait until Oct. 31 to get a connection with the spacecraft as it was blocked by the sun. 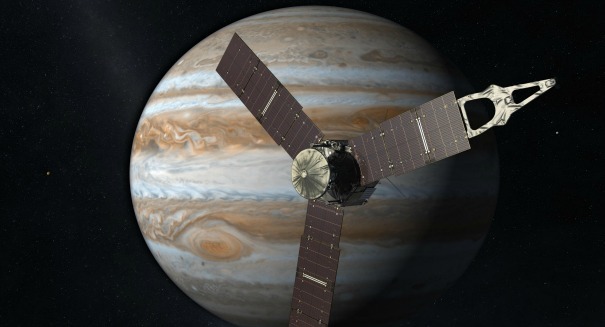 The science that Juno gathered was stored in its memory until recently, when it was able to make contact with Earth and start beaming it back to us. Juno first arrived at Jupiter back on July 4, 2016, and has endured the tremendous magnetic field of Jupiter, which is 20,000 times the strength of Earth’s. Juno orbits Jupiter once every 53 days, traveling in an elliptical path that sends it far from the planet and then very quickly very close to the planet’s cloud tops. The next close flyby will happen Dec. 16.